Built in 1911 by W H Murray (B 47 p51), possibly helped by his son, C H Murray, this replaced an iron church known as St Andrew, Norway, founded in 1885 from Christ Church, Seaside (CDK 1886 pt 2 p146). The style is free Perp in dark red brick, contrasted with white stone dressings. Particularly indoors, the combination of the brick and the dark roof is perhaps rather oppressive. Outside, there is no tower and the low aisles and tall clerestory windows with panelled tracery and prominent transoms may derive ultimately from King’s College Chapel, Cambridge, though the detail, notably at roof-level, is far removed. and the roofs are wood, supported on shafts. 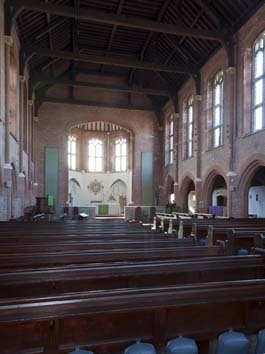 The proportions of the interior are broader and there is no obvious precedent for one less happy feature, whereby an extension on the nave side of each pier of the low arcade, leads in turn to a smaller shaft rising to the wooden roof. There is an eastern apse with more windows like the clerestory and a low western baptistery with lancets, which looks like an afterthought but appears to be part of the original design. 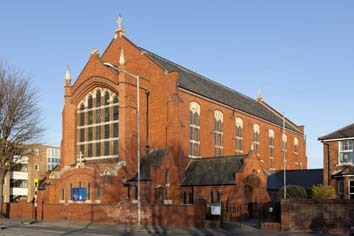 Costing £5181 (CDG 213 p167), it is a simple district church with few fittings of note. Glass: (Lady Chapel) Annunciation and Nativity, 1946 by M Chilton (JSG 30 (2006) p132). A single light with glowing colours.